quarrygirl.com » Blog Archive » yalla truck’s vegan firestarter sandwich! WOW! omg i am so bummed i missed out on this yesterday!!! Thanks so much for posting about Yalla. I went after your first blog on them and I am hooked. Best falafel in town. And I didn’t even know they had a secret menu! i am hooked as well. it’s the best falafel sandwich i can find in LA! How does the falafal compare to Hummus King’s? @yosoyliz: I love both yalla and hummus king, and the falafels are totally different. yalla’s are small and super crispy, while hk’s are bigger and more fluffy in the middle. just depends what you’re in the mood for! They keep teasing me by being near where I live at lunch, problem being that I don’t work near home. There’s a Zankou Chicken down the street from work, but their falafel really isn’t very good (dry and dense). I love vegan fast food! Ok, QG, thanks for telling me about this place. 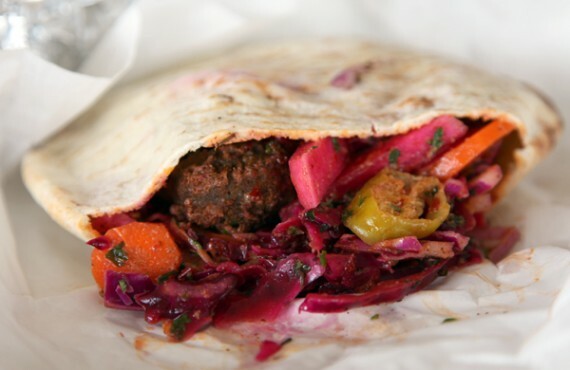 I think it’s the best falafel in LA. The staff are super nice and I’m really jazzed to be going there as often as I can. HINT HINT: I work in mid wilshire. Park at LACMA and I’ll be there! YES! 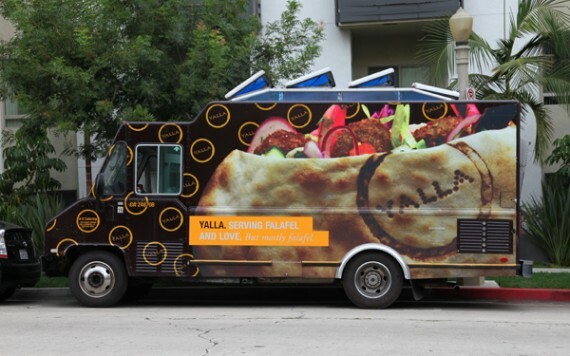 Finally a vegan-friendly middle eastern cart in LA! I am so happy you posted this. Too bad they can’t just loose the dairy and be vegan. The good food trucks never come to Santa Monica.